Sheldon died Thursday, three weeks after he fell at his home gym, fracturing a vertebra in his neck. He was 71. It was a year into George Sheldon's tenure as secretary of Florida's long-troubled social service agency when a killer earthquake struck Haiti. Though the department had earlier been criticized for losing track of its own foster children, Sheldon suggested it oversee relief efforts for thousands of Haitians in Florida, a mission some had compared to the 1960s "Pedro Pan" airlift of Cuban exile children. In round-the-clock shifts that lasted a month, workers with the Department of Children & Families met 1,056 flights of returning Haitian Americans, sheltered and processed 720 Haitian orphans destined for adoptive families and helped oversee medical care for 628 medical evacuees. DCF handed out about $26 million in cash assistance. The way he mobilized his agency to assist children displaced by the quake typified his compassion and determination to help those in need. "When these kids get off of flights, it's amazing when you put a teddy bear in their hands; they change from desperation to hope," Sheldon told a Miami Herald reporter at the time. A native of Tampa who was considered a liberal lion in the Florida Legislature when Democrats controlled both chambers, Sheldon later traded politics for a career in government, becoming a top administrator at DCF, the federal Department of Health and Human Services, the Florida Attorney General's Office, St. Thomas University's law school and, most recently, Miami's privately run foster care group, Our Kids. In a 2010 interview, Sheldon said he mostly tolerated politics as a vehicle for doing good. "Ideological issues really consume 5 or 10 percent of your time in government," he said. "They consume 90 percent of your time in campaigning, but 5 percent of your time in government. I really believe that." Though Sheldon had used his law degree to prosecute crimes and teach aspiring lawyers, it was his work with children that gave him the most joy. As DCF secretary, he met regularly with adolescents in foster care, and advocated laws and policies designed to normalize their childhoods and improve their chances of success in adulthood. "George's work to protect children orphaned by the earthquake was heroic," said Mark Riordan, who worked for Sheldon as a spokesman and, earlier, had run his campaigns. "He mobilized a social services army. For many, maybe all of us at DCF, and many other agencies, it was our proudest work." "George always believed that people working together could solve any problem. And he believed government could, and should, facilitate that work." Tammy Workman had been a recent graduate of foster care when Sheldon and his boss, the then-DCF secretary, Bob Butterworth, recruited her to help set agency policy for adolescents in care. The day she was set to begin her new job as a policy analyst, Butterworth retired. "It was a kick in the stomach, because I thought I was going to work for [Butterworth]," she said. "But he was just so sweet and kind and loving," she said of Sheldon, who took over as secretary. "He was always about the kids." In her role as analyst, Workman developed a supported employment program for youths who aged out of care, called Operation Full Employment, and another program that allowed brothers and sisters in foster care to attend summer camp together, called Camp Sib. "They said they wanted me to be the face of" DCF's efforts to reform care for adolescents, Workman said. And it wasn't about scheduling meetings and patting themselves on the back, she added. Sheldon and his staff sincerely wanted to improve the lives of kids and young adults like her. The experience helped shaped her, said Workman, now 41. It enabled her to see herself as a competent, mature leader — for the first time in her life. Sheldon said his own childhood equipped him to understand what life was like for some of the kids he met while doing child welfare work: While his childhood was a happy one, his family lacked many of the advantages that middle class households could afford in the post-war years of the 1950s and 1960s. George Henry Sheldon was born in New Jersey, the last of six children raised by moderate Republicans. His father was a career military man; his mom a lunchroom worker. He was the first in his family to go to college. "We were not well-off," Sheldon said in an interview. "Today, you would call it poor." Though his family lacked wealth, Sheldon said, he soon realized that many in his adopted home of Plant City were being denied something far more basic: dignity. In Hillsborough County, schools still were segregated, as was much of civic life. When Sheldon saw a "colored" sign above a public water fountain, he later said, "I asked my mother if that meant the water was colored." Sheldon embraced the Great Society, a series of policy initiatives aimed at reducing poverty and instituted under President Lyndon Johnson, fought to integrate his family's church, and eventually went into politics as a liberal Democrat. One off Sheldon's first jobs was as executive director of the Association for Retarded Citizens' Tampa chapter; the group now is called The Arc. He couldn't have been older than 24, said Lance Block, who worked as an intern and legislative aide for Sheldon during the late '70s and '80s. In 1988, Block's daughter was born with Down Syndrome, a genetic disorder linked to developmental disabilities. "As I look back now, most off the people involved with the Arc, especially in the '70s, were parents [of disabled children]. It was an organization driven by families, and yet here was this 20-something-year-old who was already committed to helping people. He didn't have a brother or sister who was disabled. That was just the kind of person George was. "George was the eternal champion for the vulnerable, the disenfranchised, the sick and the poor," Block said. In the Florida House of Representatives, where Sheldon served Tampa from 1974 to 1982, he pursued an unabashedly liberal agenda: He pushed to soften the penalties for possession of small amounts of marijuana; he supported bills to protect runaway youths and improve conditions in nursing homes; he sponsored a bill to allow gay men and lesbians to adopt children. Legislation he backed to deregulate the trucking industry was inspired largely by Sheldon's sympathy for impoverished Floridians. He believed they were at the mercy of powerful trucking and bus industries that kept fares and prices artificially high, said Martin Dyckman, now retired, who covered politics and wrote editorials for the St. Petersburg Times, now the Tampa Bay Times, for decades. "The trucking industry was full of arcane regulations that kept the prices up, and the lobbyists dug in their hells," he said. Sheldon, Dyckman said, was a kind of legislative Don Quixote, who often "pursued an impossible dream." And, unlike many others, he never accumulated the kind of wealth other politicians sought. In the 1970s, when the Legislature passed financial disclosure laws, Sheldon often ranked dead last among his colleagues in the House. One newspaper led a story about the financial worth of lawmakers by noting that then-Miami-Dade Rep. Elaine Bloom disclosed ownership of a pure-breed dog whose declared worth was greater than Sheldon's, Dyckman recalls. "George was never about the money," said Block, who ran Sheldon's ill-fated 2014 attorney general race — Sheldon's last. "He hated asking people for money. "He loved pressing the flesh, and public speaking. But in that campaign, I couldn't get him to make the phone calls [seeking donations]." Former Attorney General Bob Butterworth, who was Sheldon's closest friend, recalls walking with Sheldon and and local Tampa-area reporters from Sheldon's childhood home, a single-wide trailer, to his elementary school in Plant City during Sheldon's unsuccessful bid to be elected education secretary. "What really surprised us," Butterworth said, was how modest the home was. "It was, at most, one bedroom and one bath. If it was more than 20 feet long I'd be surprised." In 1982, Sheldon ran for a redrawn congressional seat in the Tampa Bay area that appeared within reach for a Democrat. He lost the race to Republican Mike Bilirakis, and never won an election again. In 1999, Sheldon left a private law practice to become Butterworth's deputy attorney general, running the agency's Tampa outpost, overseeing civil rights and consumer protection litigation, and helping to open a satellite office in Orlando, Butterworth said. He remained in the post until 2003, when he joined Butterworth at St. Thomas University as associate dean at the law school. "I cannot think of anyone I've met in my professional life who was more dedicated to public service, and for the right reasons," Butterworth said. "I cannot remember a time when he lost his temper or raised his voice." Twice Sheldon ran against another Tampa Bay native, Charlie Crist, for statewide office, first for education commissioner, and then for attorney general. 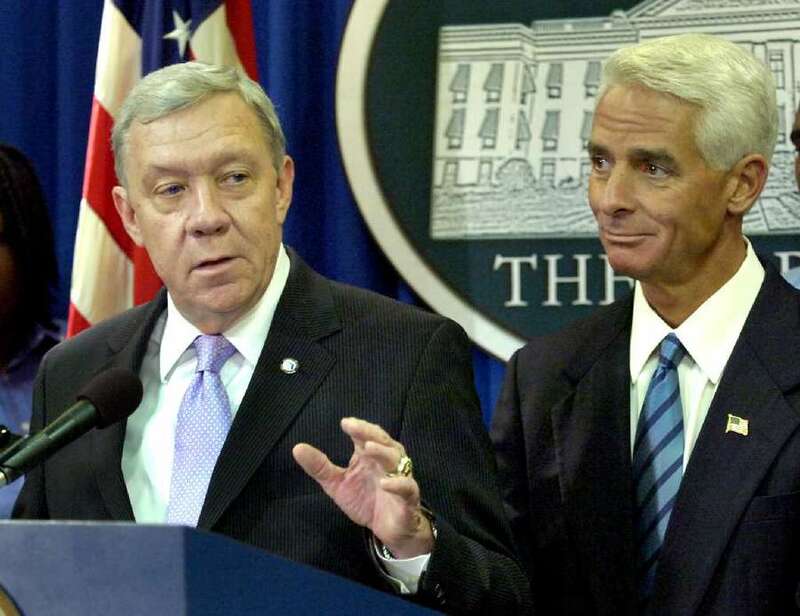 The campaigns were so cordial that it was Crist, then a Republican governor, who appointed Sheldon as DCF secretary in July 2008. "While we were opponents, we were never enemies," Crist, now a Democratic congressman from St. Petersburg, said Friday. " Just opponents." "It was a relationship of mutual respect." A hallmark of Sheldon's administration, Crist said, was its commitment to transparency, even when the news was particularly bad. In 2008, when a disabled Tampa boy was removed from an organ procurement list because he was in foster care, Sheldon, then DCF's deputy secretary, instructed subordinates to discuss the boy's plight openly with a reporter — an enormous break with the agency's long tradition of secrecy. Within a week, the 15-year-old had been given a new liver. Sheldon frequently made decisions that improved the lives of individual kids — even as they did little to help his agency's public image. In 2008, Sheldon heavily lobbied lawmakers to approve an $18.2 million, record-setting claims bill for a Palm Beach County girl who suffered profound brain damage in a savage beating after state child abuse investigators failed to protect her. As a toddler, Marissa Amora had been beaten nearly to death by her mother's boyfriend, one month after DCF investigators received "urgent" reports that she was in danger. Dawn Amora adopted the girl from foster care, and fought for seven years for Marissa to get help from the state. Amora — furious that DCF had spent millions fighting the family's lawsuit, rather than helping Marissa — invited Sheldon and Butterworth to visit the family at their home in the Panhandle. Amora was shocked when the two showed up in Marianna and asked what they could do to help the little girl. Months later, Sheldon saw Marissa again at a state office building cafeteria. "I will always remember the day Sheldon got on the floor in Tallahassee, put on a fake mustache, and played with my daughter as if he were her best friend," Amora said Friday. "She called him Uncle George." "He saved her life," Amora said of her now-19-year-old daughter. "We loved him. He cared more about children than almost anyone I have ever met. And it was genuine."